STILL playing at his best footy at age 36, there's no denying Brent Harvey is a freak of nature. 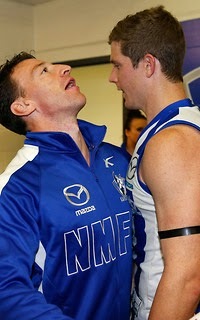 But this pre-season the North Melbourne champion is taking his game to another level, literally. 'Boomer' has carved out a stunning career as a premiership player, four-time All Australian and five-time Syd Barker medallist. And it goes without saying that he has adapted to the changing face of the AFL to play at the highest level for 19 seasons. But until now it seemed there was one thing the 384-game veteran could never do much about – his height. Before last season, the diminutive midfielder was listed in the AFL's database at 167cm. However, it appears Harvey is on track for a second coming as a key forward in a bid to add to his 458 career goals. Midway through 2014, Harvey's height was mysteriously updated to 172cm after a remarkable 'growth spurt'. And for the 2015 AFL Record Season Guide his stature has been listed as 175cm. The silly season has obviously started early down at Arden Street, with a Roos insider pointing the finger at long-time strength and conditioning coach/dietitian Jona Segal. But with Harvey burning up the track this pre-season – and finishing second behind hard-running Sam Gibson in a challenging 'yo-yo' test on Thursday – perhaps Segal should be receiving credit for Boomer's fitness instead as the veteran chases down the 400-game milestone.